Northern Ireland's Rory McIlroy during day one of the Irish Open. WORLD NUMBER TWO Rory McIlroy has singled out his driver as the root cause for another average display in the first round of the Irish Open on Thursday. McIlroy signed for a two over par 74 to be trailing seven shots behind close friend and fellow Irishman Shane Lowry who shot a five under par 67 to secure the clubhouse lead on a rain-softened Carton House course. While Lowry, who also played alongside McIlroy, managed six birdies in his round, McIlroy continues to struggle with the driver in grabbing only two birdies but also having to cope with four bogeys. “I drove the ball really well last year and the driver was a big factor to my success and I was hitting long and hitting it straight but this year I have just got into a couple of bad habits,” said McIlroy. “If I miss one fairway that’s fine but when I’m missing it left and also missing it right like today that’s hard to stand up on the tee and be confident. “I am trying to stay patient and I don’t want to say I’m accepting this but there is nothing else I can do and try to play well and play my way out of this. McIlroy had teed-up in the 2million euros tournament as the overwhelming crowd favourite and with organisers expecting to better last year’s 106,000 attendance at Royal Portrush. Lowry, who captured the event in 2009 as an amateur, showed his familiarity for Carton House given he has a house on the estate and also represents the Co. Kildare course on Tour. “It’s a real privilege to play on my home golf course, stay in my own house and have all of my family and friends up home to watch me,” he said. Lowry is playing alongside McIlroy and Thomas Bjorn for the opening two rounds and was asked his assessment of McIlroy’s game. “Rory’s Rory and I would not be too worried about him at all,” said Lowry. Denmark’s Bjorn, winner of the Irish Open at Carton House in 2006 and runner-up last week in Munich, shares second place on four under par with England’s Paul Casey and Australia’s Andrew Dodt. Email “McIlroy blames low-key Irish Open start on driver”. 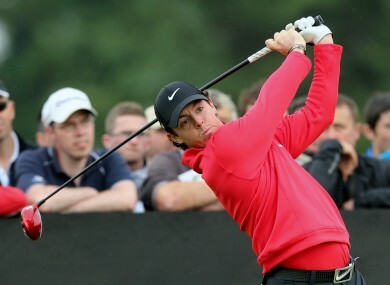 Feedback on “McIlroy blames low-key Irish Open start on driver”.